I hurriedly woke Noy up to start preparing to leave. Surprisingly, we both had a good night’s rest. The bed was very comfortable. 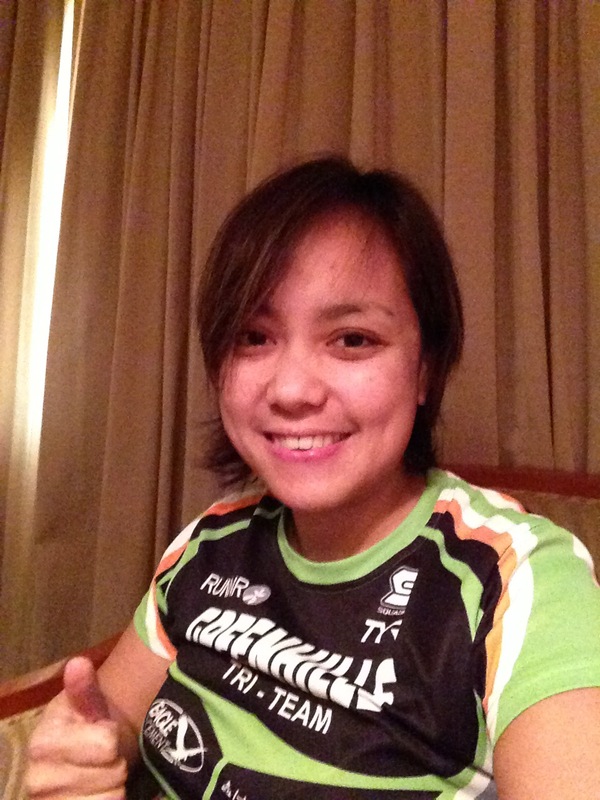 Two thumbs up to Subic International Hotel Delta. After a quick shower, we donned our trisuits, applied Safe Sea sunblock, trislide, body glide and headed to Dungaree beach. We have our own transition boxes in case none was available at the transition area. I know, I know, Bike King organized this race so it’s pretty standard that they would provide these but hey it’s my first time to join an event organized by Bike King. Thanks to Waze, yes we are so dependent on this app, we got close enough to Dungaree beach to park. I realized that we would need to ride our bikes to the transition area as it’s quite far from where we parked. Oh…no wonder they gave away those transition bags. Hey, it’s my first time remember? So we quickly transferred our stuff to the bag and rode our bikes to the transition area. I wanted to try wearing my tri shoes going to transition so I wouldn’t have to carry it but didn’t bother clipping my right foot so I can easily drop my right foot during dismount. During the course of the short ride, it somehow clipped itself to the pedal without that audible “click” so when I was about to get down, I lost my balance and almost fell. Oh no…Is this a bad omen? I saw Tri couple Glenda and Timmy excited to start. How I wish I shared their enthusiasm. We deposited our bikes at the transition area, fixed our stuff, visited the potty then waited for the sun to rise before hitting the beach to warm up. 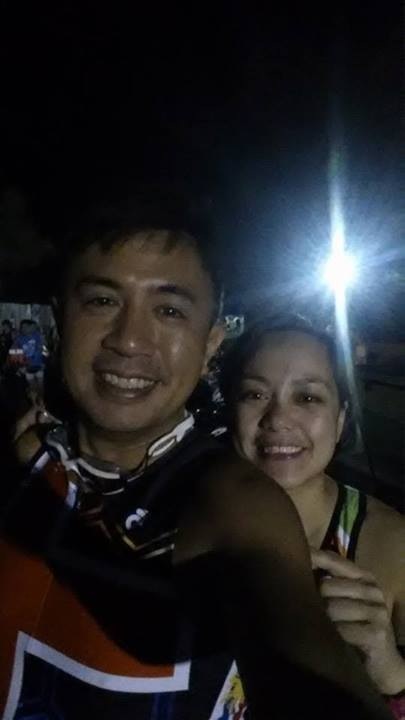 A few minutes before 6am, they let Wave 1 enter the beach to warm up. I was nervous, worried that the water might be too cold that I will lose my wits. I was frantic, seeing the route. It looked like a daunting task. It looked really faaar. This is how half of the route looks like from afar. Grabbed from Running Photographers FB wall. I saw my teammates Candy and Majul and they told me to just relax and be calm.Majul made me smile as she told me that this was her first everything. Oh…someone’s more brazen than me. I felt a bit better. 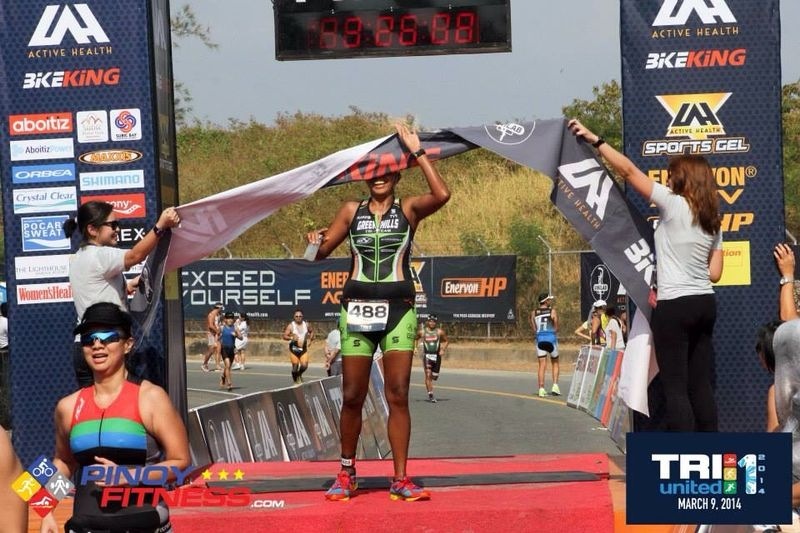 I was chatting with Lynette Ermac (wife of idol teammate – Bryan) and Joy Vargas of Team Endure, when they announced that we can now start warming up. Ohhhh surprisingly, the water wasn’t too cold. Then I remember that I am quite used to cold water. Swimming in Chateau Verde’s freezing pool has its perks. Ohhh…the water’s nice. Ohhh…look I’m swimming. Ohhh…ahhh. Hey, it’s not so bad. After two minutes, we were asked to get out of the water as we were about to start. Barely out of the water and still chatting with Majul, they announced that we can begin. Huh? No countdown? I let majority of the triathletes swim right ahead. Coach Nonoy was in my head. 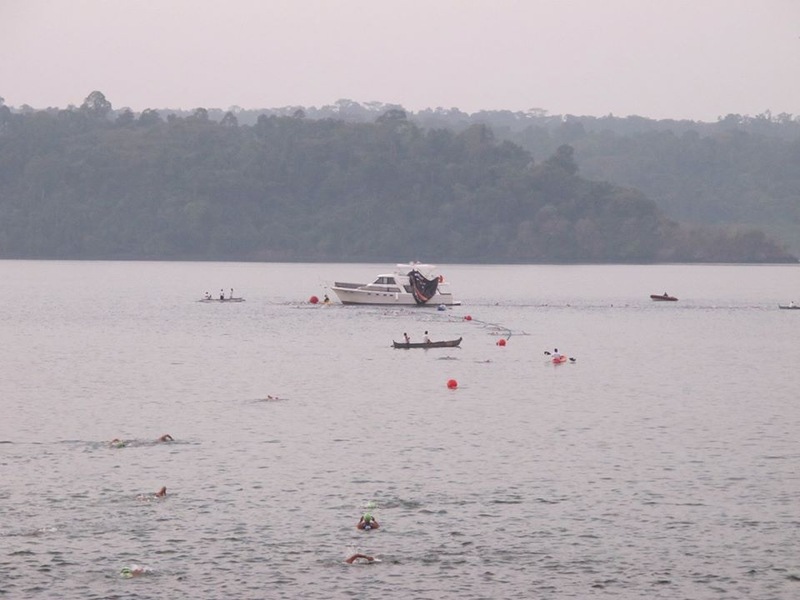 Swim far from the buoy and make your way in. I was actually doing it. Relaxed and happy. That’s how I remember my state of mind during the first part of the swim. I tried to sight as often as I can. Lalala, I was actually doing it. And there it was. My dreaded abyss. Beach, some corals, then the abyss. Yikes. Calm thoughts. Think long. Focus on your stroke. Relax. When I lifted my head to sight, I was way off course. I had to work my way back to the buoy. I stopped briefly to admire the yatch. Wow! One day, I should get one for Noy. Hey, it’s free to dream right? I continued swimming. Hey, fish. Cool. Hey, what are those? They look like swimming fireflies. Oh, it’s another buoy. Damn, this guy beside me who was not swimming but was instead pulling the lane line. Whenever there was a nearby kayak, he would swim. Once the kayak is out of sight, he would again pull the line. Tsk tsk. I wanted to reprimand him but I should just really mind my own business. I continued on. I keep on bumping the big orange buoys (Blooper # 1) and keep on hitting the lane lines that I decided to just stay far away from both. Before I knew it, my hand was able to touch the sand. I stood up and realized that the shore was only a few steps ahead of me. How embarrassing. Blooper # 2. 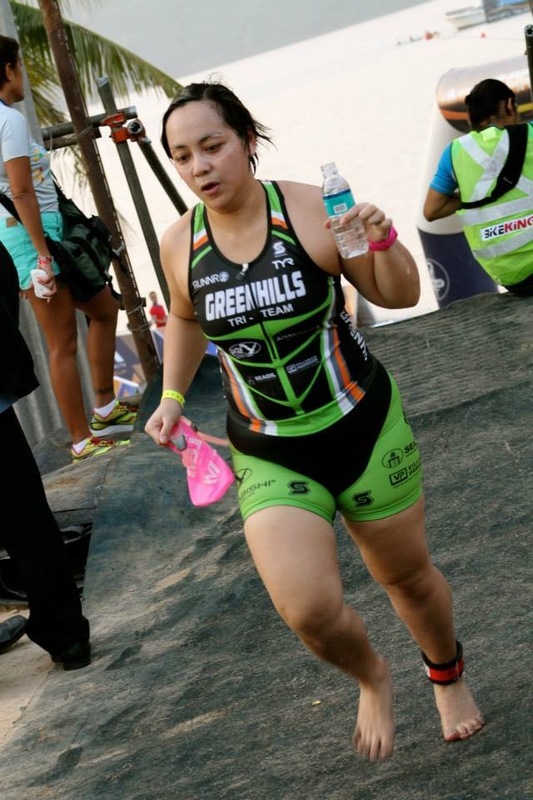 I was surprised to find out that I finished the swim event in 46mins. I know it’s slow but I was expecting to finish in 60mins if I do finish at all. 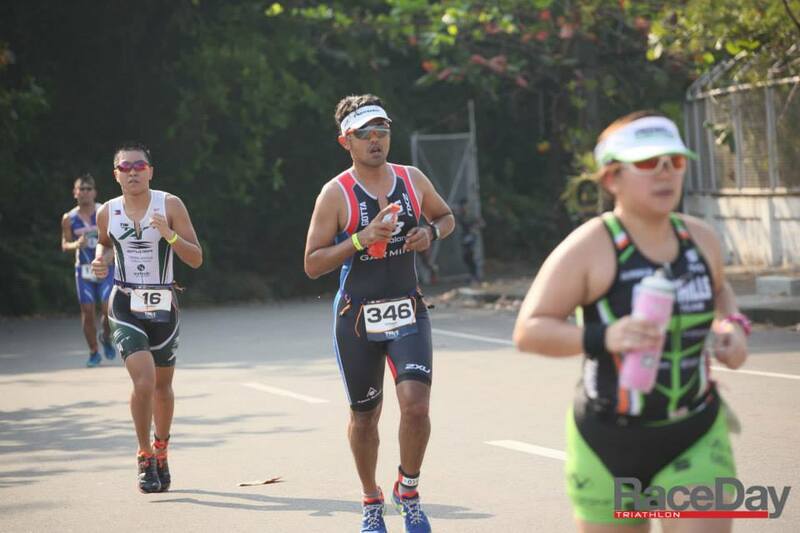 I should’ve fixed my hair before going to the transition area. Wipe feet. Wear shoes. Helmet. Bib. Shades. Consume GU. Camelbak (Yes, I decided to wear this. Better to look foolish than to be thirsty). Bike. I hurried to the mount area. Dreading that I might not be able to clip my shoes to the pedal. True enough, I had a difficult time. What do I do? Time was ticking and I still have not mounted my bike. Ah…a truck. I made my way to the truck, held on to it for support and clipped my shoes to its pedals. Yes! Blooper # 3. Timmy, Glenda and I did a bike recon a week before challenge of the TU1 route. It was a pleasant ride, some hills. I found the steep descents coupled with winding terrain a bit too scary for me so I took my time. I really need to work on making U-turns while on my bike. I slow down almost to a complete stop and I lose the momentum. This is definitely an area that needs improvement. Thanks for the photo Tagumpay Bros! Some say my seat is a bit too low. But any higher than this would make my leg super straight when extended. I bought this bike second hand from a friend of James Rosca. She’s about 5’4″-5’6″ so obviously the bike is too big for me. But I just loved it the first time I saw it. Maybe this is why my seat looks too low when in fact the frame is just too big. After 10kms or so, a weird sound emanated from under my seat or behind me. I prayed hard that it wasn’t a flat. I brought tools in case I encounter a flat but I didn’t want the hassle of changing my tire. Thank God the sound disappeared after a few minutes. Only to return at km 33. It was ignored by yours truly. I know I didn’t give it my all during the bike ride. I was conserving my energy for the run. Since I didn’t wear my trusty Garmin, I had no idea what my cadence was, what my Heart Rate was. But after the ride, my legs didn’t even feel heavy. I was happy that I didn’t fall as I dismounted my bike. 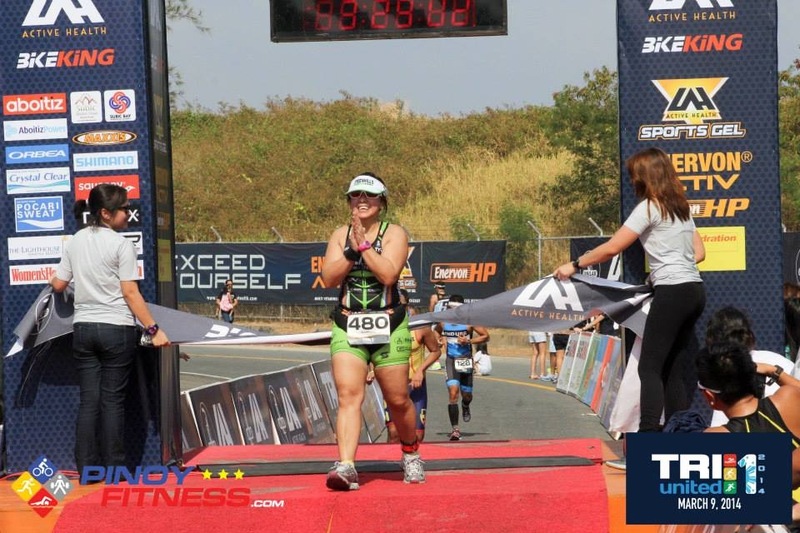 As I was heading into the second transition, I was surprised to see so many triathletes barefoot as they were jogging/walking towards their designated spots. I soon found out why. It was so difficult to jog wearing your cleats! My spot was so faaaar. It must’ve taken me more than 3 minutes to get to my spot. It’s amazing how the others seem to look like they’re fully in control of their bikes, with just one hand on the saddle or on the handle bar. I, on the other hand, was really struggling so I decided to just take my time. See how my bike is slated towards me? I tried to keep it upright but it didn’t want to. I must be really short…Haha! Socks. Shoes. Cap. Consume GU. Hydrate with Gatorade. I forgot to remember to comb hair and more importantly, LEAVE BOTTLE OF GATORADE. I realized that I was holding on to my 24oz bottle! Blooper # 4. There was this one guy who ran beside me and said – Takot ka ata mauhaw? (Afraid to get thirsty?). Hahaha! I wanted to leave the bottle at one of the hydration stations but it might get lost so I hanged on to it. Me with my HUGE bottle. Haha! As I was heading towards the first turn around point, I saw Candy already at her 2nd loop. She told me – Next time choose a smaller bottle. Haha! She wanted me to run with her but I decided to keep my own pace afraid that I would run out of juice during the 2nd loop. 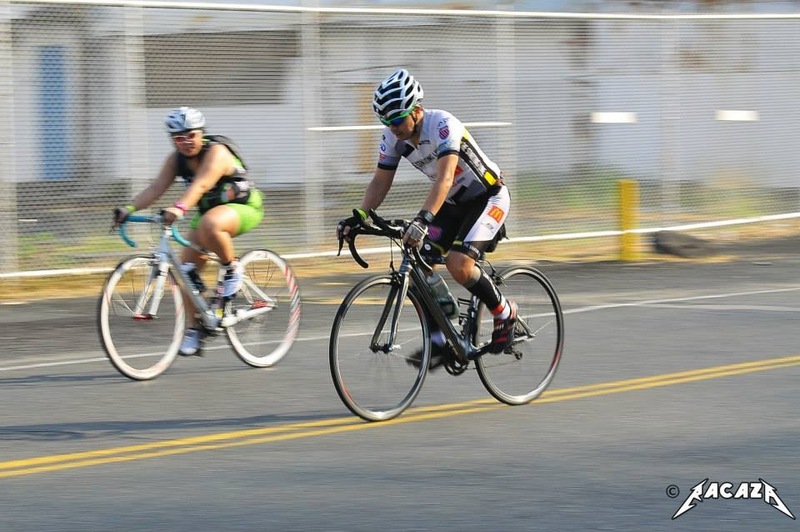 During the bike leg, I was worried that I have not seen hubby. They started 30 minutes behind us as part of Wave 3. I saw James and Sherwin who were also part of Wave 3 but not my Noy. I was worried that something might’ve happened to him during the swim. Thankfully, I saw him as I was finishing my first loop. I quickly shouted out – What happened to you? Ang bagal mo! (You’re so slow!) Of course, I was kidding. My humongous bike bottle was getting in the way. I had to get rid of it somehow. Thankfully, I saw Carina and Raffy and left the bottle to their care. My teammate Sherwin caught up to me and asked, how fast are you going? To which I replied, Not sure as I didn’t wear my Garmin. Well, your pace is about 6:15. I thought to myself – will I make it? Can I keep this up? Don’t pressure me Sherwin! Haha! I saw my Coach, Ige Lopez twice during the run leg and he actually had a smile on his face, encouraging me and saying I was doing well. That boosted my will to finish strong. I initially didn’t have a target time. But I knew that I needed a goal. 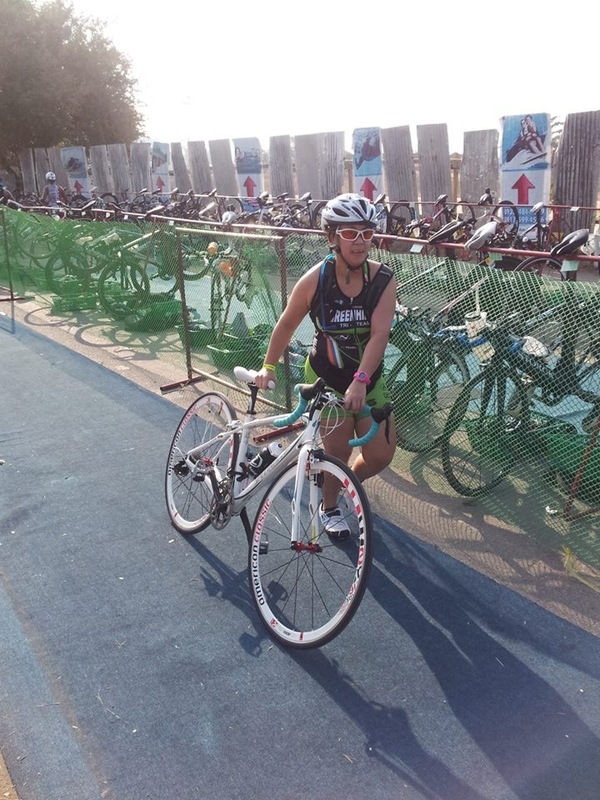 I wanted to finish the swim in an hour, bike in an hour and 20 mins and run at 1 hour 10. So I should finish in 3 hours 30 mins. Naturally, my target is sub 3:30. It was getting really hot. I can feel the heat burning my neck, my scalp, my arms. But I don’t let it get to me. I continued running. Don’t stop. Don’t stop. I said a prayer which inspired me to say the rosary. On the 3rd mystery, I realized that I was almost at the finish line 3:25. Push. Push. There…I can finally see the finish line. A guy in front of me was taking his time. I didn’t want to overtake him as I didn’t want to be rude so I shouted – Go go go instead. I MADE IT! Sub 3:30! I SURVIVED! I screamed a loud YES!!! And saw two strangers who shared my enthusiasm giving me two thumbs up! Thank you LORD! With you nothing is impossible! 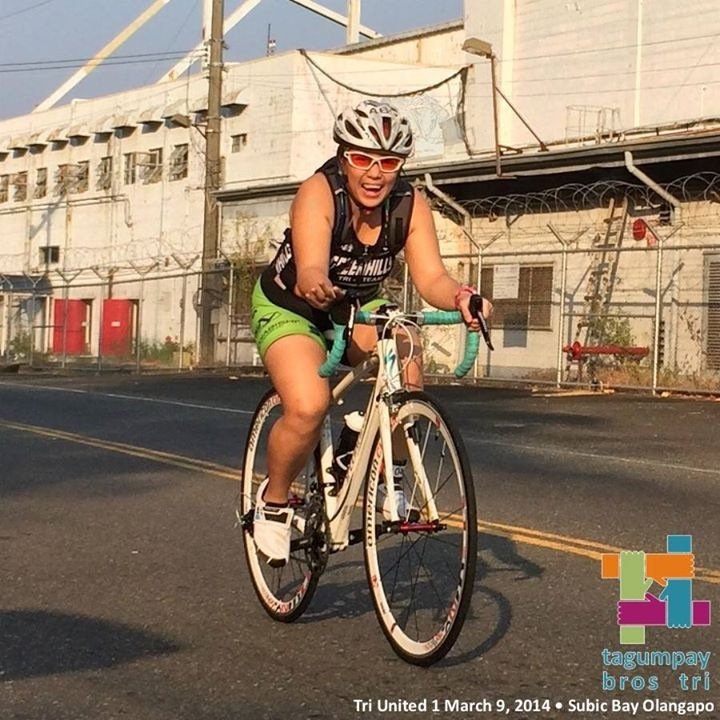 See my 1st finisher photo? That’s Blooper # 5. I didn’t realize that the banner would cover almost half my face. Haha! Nonetheless, my teammate, Majul Maccay made me feel better. This is her finisher photo. Sorry, I couldn’t stop laughing when I saw it! Peace Majul! PS This was posted with approval from Majul. Hehe! I saw my Coaches Nonoy Basa and Ige Lopez. They congratulated me and I thanked them immensely. After chatting with friends and teammates, I decided to look for Noy and pace him. So proud of Noy because he finished in 3:34, only a few minutes behind me. Indeed my hubby is improving. Overall, the event was well attended, well organized. There were ample hydration stations and the post race food was super good. Ineng’s barbeque FTW! 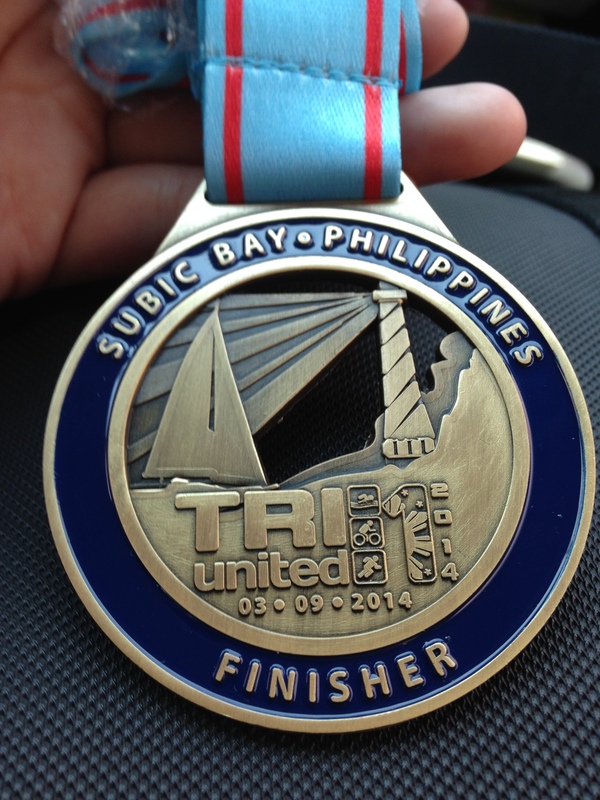 My only concern was the lack of finisher’s medal. Apparently, finisher medals were available for redemption at the Bike King booth. No one knew because it wasn’t announced. As soon as Noy and I found out that these were available, we headed back to the event and claimed ours. 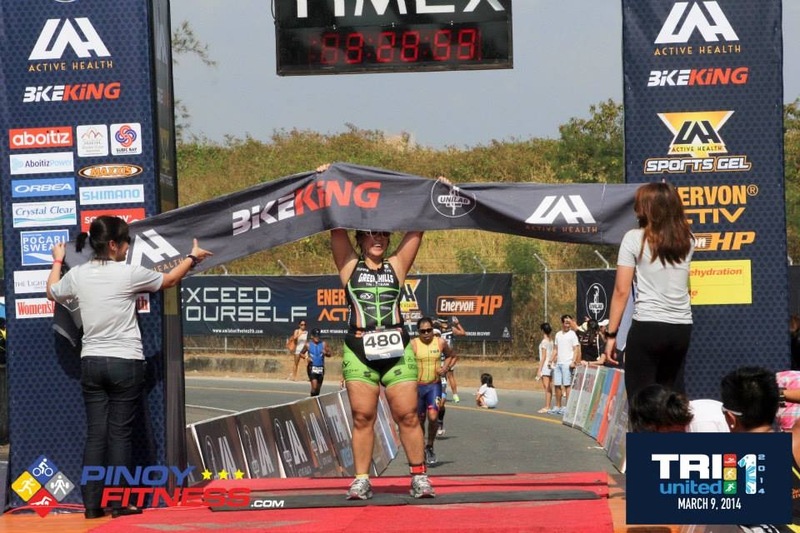 “If you did not receive your finisher’s medal yesterday, you may claim it starting today at Bike King, Bonifacio High Street. A valid ID will be required. We will also honor authorization letters with copies of your ID. We are open everyday from 11:00am to 10:00pm. This was me. After freshening up. Ready to drive back to Manila. 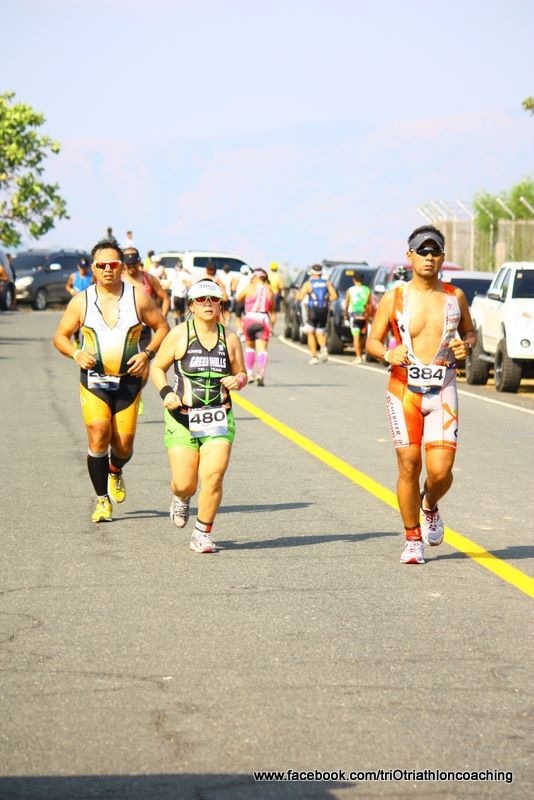 I look forward to more tri races in the future! See you at the starting line. Hi Gail, it’s actually not a blooper to swim until you can touch the sand. You’re faster getting to shore that way than trying to wade through the water. 🙂 Congrats on finishing your first standard distance tri!